1. King Philip II of Spain (1527-1598). 2. Robert Dudley, Earl of Leicester. 3. King Erik XIV of Sweden (1533-1577). 4. Archduke Charles of Austria (1540-1590). 5. Henri, Duke of Anjou, later King Henri III of France (1551-1589). 6. Francis, Duke of Alencon and Anjou (1554-1584). 1. Queen Elizabeth seriously ill of small pox (1562). 5. Circumnavigation of the Globe by Sir Francis Drake (1577-1580). 2. Elizabeth excommunicated from the Roman Catholic Church by Pope Pius V (1570). 3. Bond of Association (1584). In this the Queen's loyal subjects vowed to take revenge on anyone who killed her. 4. Poor Law Act (1601). 1. Thomas Howard, Duke of Norfolk (1536-1572). Executed at Tower of London 2 June 1572. 2. Mary, Queen of Scots (1542-1587). Executed at Fotheringay Castle on 8 February 1587. 3. Robert Devereux, Earl of Essex. Executed at Tower of London 15 February 1601. The Queen's Enemies: 1. Mary, Queen of Scots. 2. King Philip II of Spain. 3. Alexander Farnese, Duke of Palma (1545-1592). 3. Sir Philip Sidney (1554-1586). Queen's Death: 24 March 1603 at Richmond Palace, London. Remembered as: The Virgin Queen, Good Queen Bess, Gloriana. 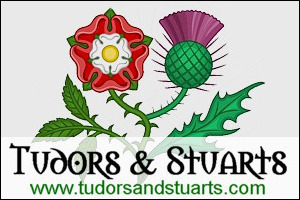 Succeeded by: King James VI of Scotland, son of Mary, Queen of Scots and her second husband Henry Stuart, Lord Darnley. He was Henry VII's great great grandson and next in line to the throne after Queen Elizabeth I. He brought in the House of Stuart. 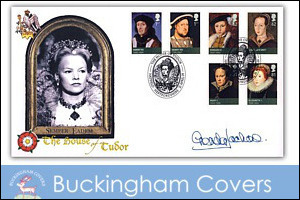 What does the R in the Queen's signature stand for? Regina which is the Latin for Queen. After a King's name it means Rex, the Latin for King. Did the Queen ever meet William Shakespeare? Yes, he acted at court. The Queen never visited The Globe theatre. Why did the Queen not marry? Political, religious and personal reasons. How did Queen Elizabeth feel about her mother, Anne Boleyn? Elizabeth hardly ever mentioned her mother, but a locket-ring she wore says more than a million words ever could: inside the ring was a picture of Elizabeth and her mother. 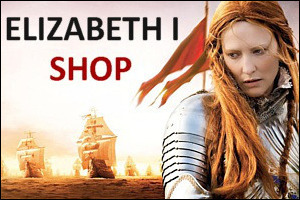 Was Elizabeth a good queen? Yes and a popular one. She ruled wisely, justly, and was a good public speaker. Did the Queen tolerate Roman Catholics? No, it was illegal to be Roman Catholic. However, so long as Roman Catholics hid their faith and went to Anglican church services the Queen turned a blind eye to their religion. Only those Roman Catholics seen as a threat to the Queen's life were punished. Did the Queen ever leave England? No, she never left England. She did want to visit Wales but only ever got as far as Bristol. What was her finest hour? Defeat of the Spanish Armada 1588. How was the Armada defeated? A mix of luck (storms at sea) and skill. What were the Queen's main accomplishments? Survived and succeeded in a political world that was male dominated, proving a woman could rule as well as any man; united her people in a time of deep religious division; strengthened Englands's economy; turned England from a second rate power into one of the most powerful countries in the world.